The Agate Street beach access closed prematurely due to erosion below the steps to the sand. A landscape scheme for a proposed renovation of the Agate Street public access. Photo by Jody Tiongco. The city is “starting fresh” on conceptual plans for beach stairways at the ends of Thalia, Agate and Pearl streets and wants public input about their design. Three meetings will be held for residents to air their thoughts about the plans, said Wade Brown, project director. All of the meetings start at 5:30 p.m. at the top of the stairs at the end of each street. The Agate Street meeting will take place on Monday, May 16; Thalia on Wednesday, May 18; and Pearl on Monday, May 23. Concrete and aluminum comprise the basic components in the plans, said Brown. The conceptual plans call for replacing the concrete stairs to the beach at each location and redoing walkways, viewing areas and benches as well as landscaping, keeping as many existing plants as possible. Redoing the stairs is needed, agrees Robert Ader, architect and member of the city’s Environmental Sustainability Committee, but capturing rainwater run-off and preventing ocean pollution could add complications to the designs. “How are they handling the storm water run-off, how are they stopping the pollutants off the street from running into the ocean. How are they capturing and filtering the rain as a resource instead of losing it as run-off?” he said. Mike Beanan, another environmental committee member, agrees that storm water run-off needs to be watched. “They don’t have to solve the problem for all of Southern California, just that one section from Coast Highway to the beach,” said Beanan. “That’s where there’s a lot of contaminants.” Brown said the infrastructure for storm drainage was not changed in the conceptual plans. Plans for Agate and Thalia street-ends call for the biggest changes to the existing configurations, explained Brown. Plans for Agate show a new viewing area to the north of the stairs. 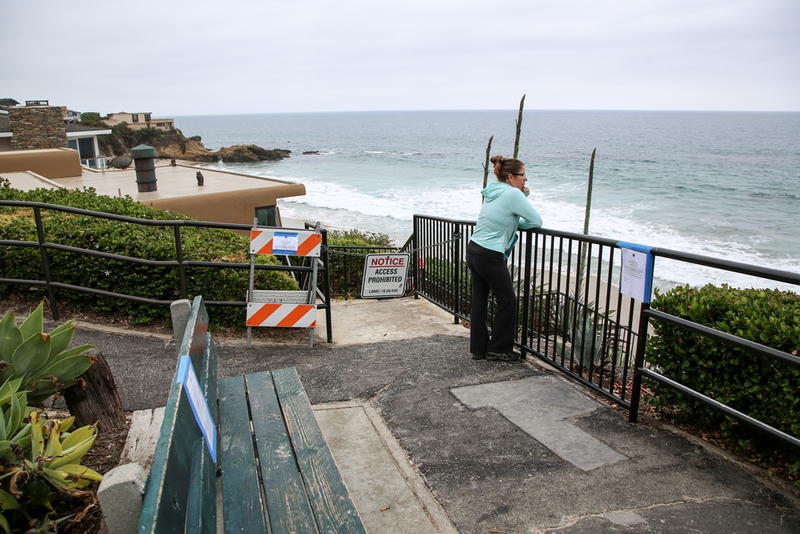 Access to Agate Street beach has been roped off since October due to stair damage caused by high surf. Emergency repair was too costly, said Brown, especially in light of the stairs planned redesign. At Thalia, the viewing area will be moved to the top of the stairs with seating similar to the mini-amphitheater at Brooks Street, only smaller, he said. A popular meeting place for surf and stand-up paddle groups, the new seating area can also be used as an unloading zone, Brown said. Plans for Pearl Street include extending the stairway to prevent drop-offs when high surf washes away the sand. An 18-inch-high concrete “seat-wall” figures in the plans at the top of the access. The stairway will be redone as it is due to a sewage pump station there that eventually will need to be replaced, Brown said. Although the plans call for redoing the street-ends in concrete, they nod to the environment with bike racks at all three sites. No esthetic features were built into the plan, which leaves any art to be determined, Brown said. “We’re allowing plenty of opportunities, like these seat walls and other areas in the landscape where they can install art if they want, but we’re going to leave that to the Arts Commission,” he said. Earlier meetings held by the city months ago to discuss plans were frustrating, Flores said. “The plans were becoming way too generic,” he said. “They didn’t reflect our town.” Flores said he plans to attend the street-end meetings. Brown expects the finalized plans to go before the city’s Design Review Board within two months. The conceptual plans were designed by Kruezer Consulting Group of Seal Beach for $100,000, he said. No costs have been determined to complete the projects, he said, which will be funded from the city’s capital improvements account. If the stairs are going to be done there is an obvious need for handicap accessability. Yes you can access the beach at Main and access the beach at Bluebird but that’s a long stretch between. I don’t believe there is a need for emergency vehicle access, but if someone was injured and in pain, a trip in a gurney carried up stairs is just going to make matters worse. A foot path ramp would help with this type of extraction. Be it at Oak St., Anita, Thalia, or Saint Anne’s .